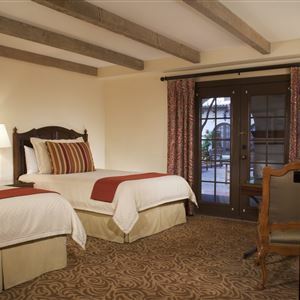 Property Location With a stay at Omni La Mansion del Rio, you'll be centrally located in San Antonio, steps from Buckhorn Saloon and Museum and minutes from River Walk. This 4-star hotel is within close proximity of San Antonio Majestic Theater and San Antonio Convention & Visitors Bureau. Rooms Make yourself at home in one of the 338 air-conditioned rooms featuring minibars and LCD televisions. Your room comes with a pillowtop bed. Premium TV channels provides entertainment, and wired and wireless Internet access is available for a surcharge. Private bathrooms with shower/tub combinations feature designer toiletries and hair dryers. Amenities Relax at the full-service spa, where you can enjoy massages, body treatments, and facials. Additional features at this hotel include complimentary wireless Internet access, gift shops/newsstands, and wedding services. Dining Enjoy a meal at one of the hotel's dining establishments, which include 3 restaurants and a coffee shop/café. From your room, you can also access 24-hour room service. Relax with a refreshing drink from a poolside bar or one of the 3 bars/lounges. Business, Other Amenities Featured amenities include a business center, express check-in, and express check-out. Event facilities at this hotel consist of conference space and meeting rooms. Self parking (subject to charges) is available onsite. 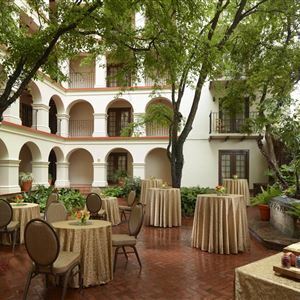 With a stay at Omni La Mansion del Rio, you'll be centrally located in San Antonio, steps from Buckhorn Saloon and Museum and minutes from River Walk. This 4-star hotel is within close proximity of San Antonio Majestic Theater and San Antonio Convention & Visitors Bureau. Make yourself at home in one of the 338 air-conditioned rooms featuring minibars and LCD televisions. Your room comes with a pillowtop bed. Premium TV channels provides entertainment, and wired and wireless Internet access is available for a surcharge. Private bathrooms with shower/tub combinations feature designer toiletries and hair dryers. Relax at the full-service spa, where you can enjoy massages, body treatments, and facials. Additional features at this hotel include complimentary wireless Internet access, gift shops/newsstands, and wedding services. Enjoy a meal at one of the hotel's dining establishments, which include 3 restaurants and a coffee shop/café. From your room, you can also access 24-hour room service. Relax with a refreshing drink from a poolside bar or one of the 3 bars/lounges.